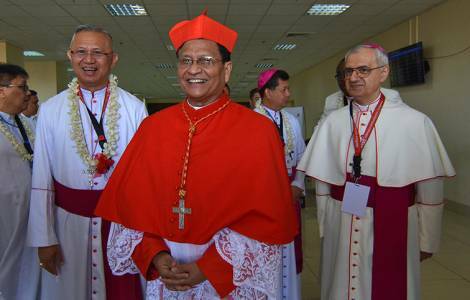 ASIA/MYANMAR - Cardinal Bo: "The Pope’s visit is a blessing; support for the rights of Muslim minorities and Aung San Suu Kyi"
Yangon (Agenzia Fides) - "The Pope’s visit to Myanmar (27-30 November) has been welcomed as a blessing for peace and harmony. Both the civil government led by Aung San suu Kyi and the military seem to be enthusiastic about the visit. Surely most of the people look for a “healing visit”. Many Burmese citizens followed the Pope’s visit to Columbia – a country that seeks peace with itself": says Cardinal Charles Maung Bo, Archbishop of Yangon in a note sent to Fides, speaking of Pope Francis' next visit to Myanmar and in particular of the delicate issue of the Rohingya minority. "Newspapers, both international and local ones - the Cardinal notes - see many challenges for the Pope, starting from "risks stoking religious tensions", since "the Pope's interventions, any comments on Rohingyas are likely to infuriate nationalists who maintain that the Rohingya are not Burmese but rather Bangladeshis with no right to live in the country". Some groups are already on the verge of war: "Ashin Wirathu, a monk who leads the Buddhist movement 'Ma Ba Tha', denounced the papal visit as politically instigated", affirming that "there is no Rohingya ethnic group in our country". On the other hand, "supporters of Rohingyas expect the Pope to express his opinion", continues Cardinal Bo. In this regard, in order to avoid tensions and not to trigger social and religious conflicts, the Church of Myanmar - explains the Cardinal - suggests Pope Francis "not to use the term Rohingya" but to "talk of humanitarian rights of the suffering Rakhine Muslims, of the need for durable solution, not violent solutions, and of the need for regional co- operation". With regards to the delicate position of Burmese leader Aung San Suu Kyi, Nobel for Peace and today minister in the government, the Cardinal confirms the position of the Catholic Church: "She needs all the support. Aung San Suu Kyi has been attacked by the media and sometimes mercilessly. She is deeply disappointed with western media. She is a strong personality. She would listen to constructive suggestion. Her achievements have been many but they have sunk in the recent events. Her own lifetime sacrifice to resurrect from the ruins of junta misrule of sixty years. It is a great historic achievement. In her fragile hands she holds the dreams of millions of this country". "Her perceptions may be wrong - Cardinal Bo continues - but her integrity and commitment are above suspect. Her leadership must continue. Appreciation of her role in democratizing this nation is much needed and must be appreciated. Her commitment to Panglong peace agreement (for reconciliation with ethnic minorities, ndr) has managed to bring all warring parties and the army under one roof. She is providing spaces for dialogue among the antagonistic parties. This process needs full support and appreciation".